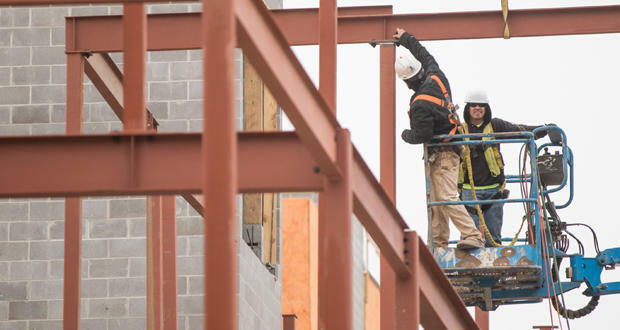 Workers at the construction site of West Village Apartments at Main Street and Fred Jones Avenue in Oklahoma City. Commercial real estate sales could slow because buyers and sellers can’t seem to agree on prices. Nationally, buyers are wary of higher interest rates, but sellers believe strong economic conditions should bring higher prices, according to National Association of Realtors Chief Economist Lawrence Yun. The Journal Record’s Molly Fleming writes Oklahoma City brokers are facing the same trend: Buyers are concerned about the economy, but sellers think their property is worth more than is being offered. NAI Sullivan Group owner and CEO Bob Sullivan said there’s a gap in the price between buyers and sellers because there are few properties available for a 10/31 exchange. A 10/31 exchange is when someone sells property and uses the income from it to purchase another, deferring taxes on the transaction. Sullivan said he tries to tell sellers that now is the time to get the property off their hands. “As interest rates keep going up, it will make it more difficult to get today’s pricing,” he said. Fleming told KGOU a 10/31 exchange allows an individual to take the income from the sale of one piece of property and apply it to the purchase to another property without being charged a tax. “There was some concern that could be taken out of the tax code which also [would] really slow down commercial sales because it's big driver for property changing hands,” Fleming said. The number of multi-family housing properties that changed hands were about the same as last year in Oklahoma City. Before this week, the average cost per units was down approximately 16 percent. However, Fleming says the average cost per unit has probably rebounded this year following the sale of the Metropolitan at 800 N. Oklahoma Ave.
“The Metropolitan in downtown Oklahoma City sold for $64 million which is about $195,000 per unit. That's a huge price per unit, given that a lot of apartments this year were about $35,000 to $55,000 per unit. In 2016 the highest price per unit was about $132,000,” Fleming said. Jacob McCleland: It's the Business Intelligence Report a weekly conversation about business news in Oklahoma. I'm Jacob McCleland and I'm talking today with Journal Record reporter Molly Fleming. Molly thank you for joining us. Molly Fleming: Hey you're welcome. McCleland: Now Molly you wrote in The Journal Record this week that commercial real estate sales me falter at the national level this year. Why so? What's going on here? Fleming: There's a difference in what buyers want to pay and what sellers are willing to accept as payment. And so nationally there's some uncertainty about the economy and a possible change in the tax code. And sellers are hesitant to give up their properties. They're asking for a higher price than what buyers are willing to pay. The other cog in the pipe is if other owners aren't selling then someone who gets rent or property can't take the money and do it 10-31 transaction. McCleland: Now what what's a 10-31 transaction? I'm not familiar with that? Fleming: Yes. That's when you take the money, the income, from a property sale and you invested it in another piece of property and then you don't have to pay taxes on your you know your new income. And so that's a discussion that's been had which the last I heard is that it's not going to change with the new tax cut proposals. But there was some concern that that that could be taken out of the tax code which also really slow down commercial sales because it's big driver for property changing hands. McCleland: So what about here locally? Are we seeing these the same trends here in Oklahoma City? Fleming: We are. I've been talking to people about this. I've been carrying this for the last several months and even so for my story when I talked to NIA Sullivan president Bob Sullivan I had barely finished a question about you know if we were seeing this locally before he said, oh yeah, I'm definitely seeing this. And so in Oklahoma City it's it's kind of a good thing I guess in sellers know how much their property is worth and think they can get an even bigger return because they believe in the city they believe in that we know what's happening and a turn around. But buyers on the other hand think this is the best time to get into the market and they want to do it at a good price. So they want to get and why they think it's going to be the lowest possible, but sellers really see you know a positive thing happening and they think it's going to be better even, you know, later. McCleland: In the multi-family sector, or apartments, the number of transactions this year is about the same as last year but the price per unit is down 16 percent. Why is this? Fleming: There were more higher priced apartments sold last year than this year. But as of Tuesday I have a feeling that that percent is either back to being unchanged or is even positive. The Metropolitan in downtown Oklahoma City sold for $64 million which is about one hundred ninety five thousand dollars per unit. That's a huge price per unit and given that a lot of apartment this year were about $35,000 to $55,000 per unit. In 2016 the highest price per unit was about $132,000. McCleland: Nationally retail has suffered because there's too much retail space and of course there's competition from online retailers and a large number of retail stores are closed. But the industrial sector is doing well. Why is industrial space doing so well right now? Fleming: Well if you think about online shopping, those items have to be shipped and then stored somewhere. And companies want to be closer to their customers. That's why we're seeing the warehouses being built by Amazon and FedEx in Oklahoma City. So the really the growth really goes back to the change in retail. Besides retail, there could be more growth in industrial with President Donald Trump's push to bring more jobs to the U.S. And I know Oklahoma works hard to get those manufacturing jobs here. So there could be more built-to-suit type industrial properties. Fleming: The thing about industrial that's also fascinating to me from the investment side is that, in my opinion, the places where industrial happens really won't change too much. Industrial is done in a certain area for certain reasons. Usually there's chemicals involved or it's loud. So I would think it's a good investment from the developer side because you don't have to worry about gentrification or you know people moving out of an area. I mean there are going to be doing that work there or somebody is going to be doing some type of industrial work in that building for a long time. McCleland: Molly Fleming is a reporter at The Journal Record newspaper. Molly thank you so much. McCleland: KGOU and the Journal Record collaborate each week on the Business Intelligence Report. You can find this conversation at kgou.org. You can also follow us on social media. We're on Facebook and Twitter @journalrecord and @kgounews.